This blog has nothing to do with either growing or using jasmine, but I want to share a wonderful experience I had today. I have a long train commute between work and home, but I don’t find it a waste of time for the hour and fifteen minutes I spend traveling in each direction. I can always find something to do whether reading, working on a project, sleeping when I feel really tired, or writing this blog for that matter. This morning, as soon as I got a seat, I started to make a garland from the jasmine I had picked before leaving. I use it to make an offering for the Ganesh statue at work, out of respect. After a few minutes, the guy sitting across the aisle leaned over and asked whether the jasmine was real. I offered him some, but he really just wanted to stick his nose in the bag and take a deep sniff. “This is very soothing.” he said. Aside from that, just “Thank you.” I continued stringing the garland for a few more stops before reading my newspaper. Shortly after that another passenger sat down next to me. When the train got to our final destination I got up and took the bag of herbs I had cut for my colleagues. She, the passenger next to me, commented on how great the basil smelled. We had a short discussion about basil on the way up the platform and she accepted some jasmine. She was delighted and kept sniffing the jasmine in her palm. Both incidents are common to me every time I carry jasmine with me, but what happened next really made my day. I got on the subway heading for my office. An elderly couple got on the next stop and sat across from me. They were probably in theirs seventies. They were holding hands, chatting and leaning against each other. What drew my attention was the affection they showed for each other. It was so pronounced, so radiant. I couldn’t help but smile and kept observing them, just short of staring perhaps. I offered them some jasmine before I got off the subway. The gentleman accepted them while still holding her hand. Both smelled them and looked up at me with a big, genuine smiles. “Thank you very much. You made our day.” He said. “No, Sir, you made my day. You’re such a lovely couple. Enjoy them and have a wonderful day.” I walked off the train. Yes, something about an older couple displaying love and affection that makes me melt. I still remember that my father cried his heart out when my mother passed away a few years ago. He was over eighty years old then and he still misses her and talks about her. After a flood of “Maid of Orleans” jasmine (Jasminum sambac) a couple of weeks ago, there are still some flowers to pick for the house everyday but not as many, not until the second wave of flowers bloom. They are forming new flower buds again and won’t slow down until they are back in the basement wintering over. Now it’s the time other jasmine give their performance. 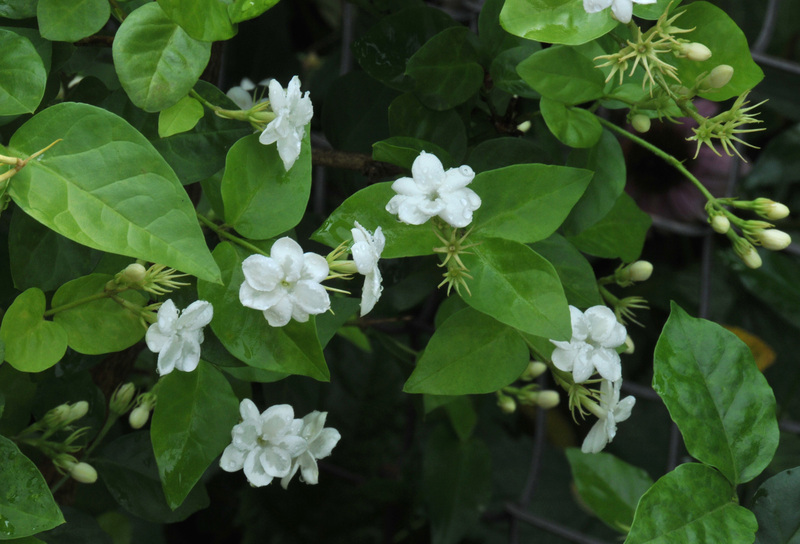 The “Belle of India” jasmine (Jasminum sambac)blooms next. Yes, they are “sambac” as well. The delicate white flowers are bigger than the “Maid of Orleans”, around an inch in diameter, with longer petals, and they smell just as sweet. Some of the flowers are even double-layer petals. 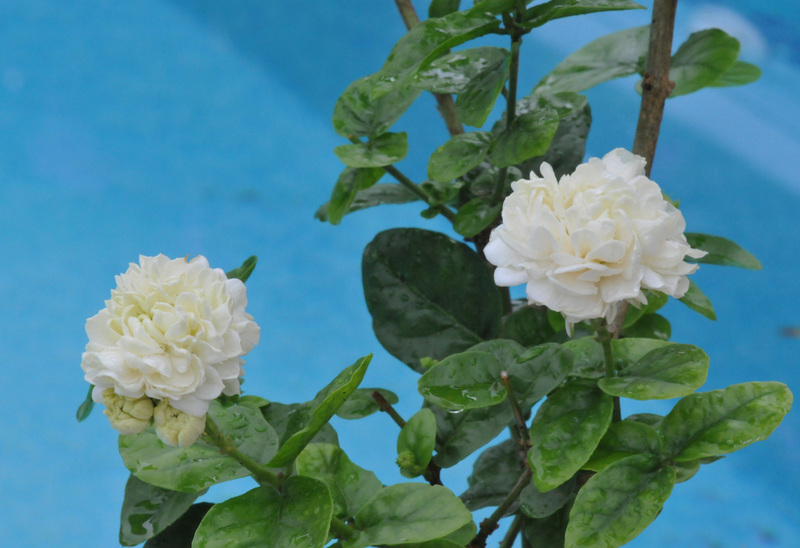 The “Grand Duke of Tuscany” jasmines (Jasminum sambac) also start to bloom. They are really grand when they bloom. Each flower has one inch diameter with multi layers of petals and strong jasmine scent. I have this vision of them in a small delicate vase on a dresser or on a jacket lapel. I did cut some flowers and brought them in the house, their fragrance got even stronger in the evening. 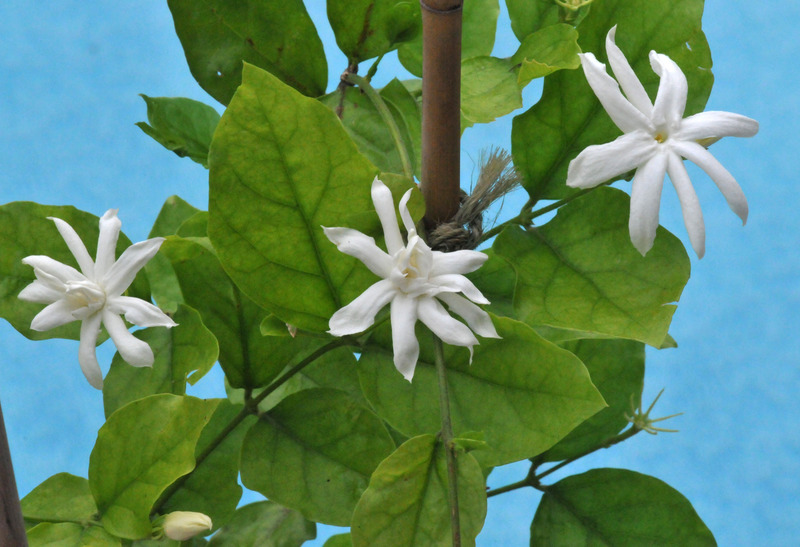 The good thing about them is that unlike other jasmine, the flowers will last a couple of days instead of blooming for only one night. They are too big to just pick the flowers off the plants so cutting them with their stem attached is a perfect way to bring them in the house. 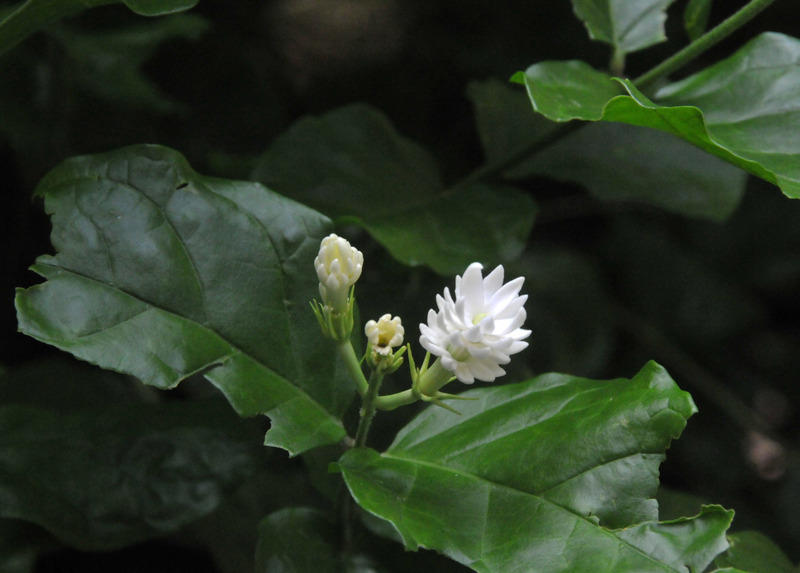 Next to bloom is the “Azores Jasmine” (Jasminum azoricum). 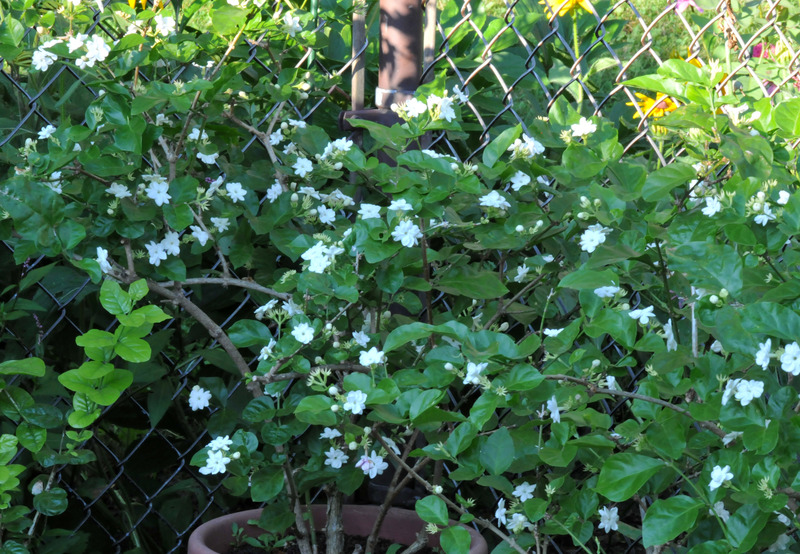 This jasmine will wind up a small trellis very well and produces flowers in clusters. Its fragrance is a little bit sweeter than the “sambac”. It’s also a fast grower and can stay in a small pot as long as you feed it well. I’m not done with the jasmine yet, still have a couple more to go. Yes, I collect as many varieties as I can find. 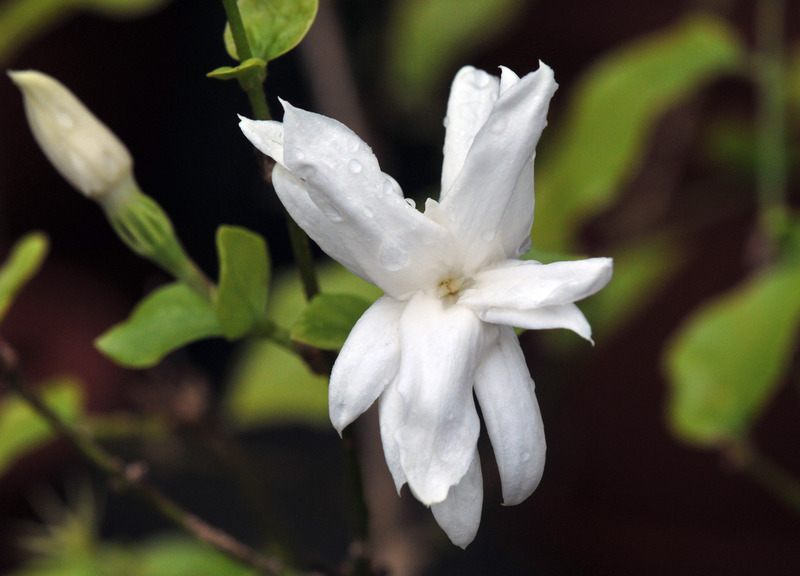 I’m still looking for one particular jasmine, English name unknown to me. I’ve seen them in Thailand but nowhere else I’ve been. It has very small flowers that like stacked up stars. I also wish I could capture their fragrance as well because the photographs alone just can’t do them justice. 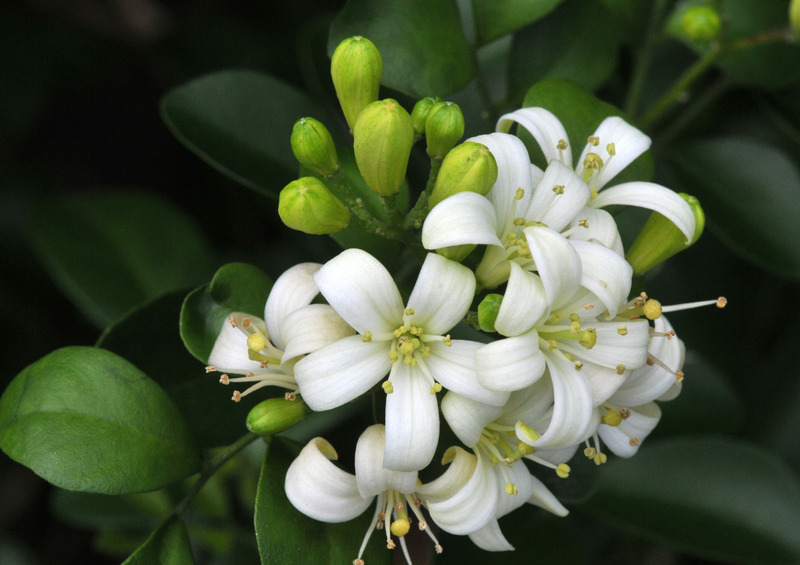 Belle of India produces larger flowers and smells as sweet. Grand Duke of Tuscany is pretty “grand” when flowering. 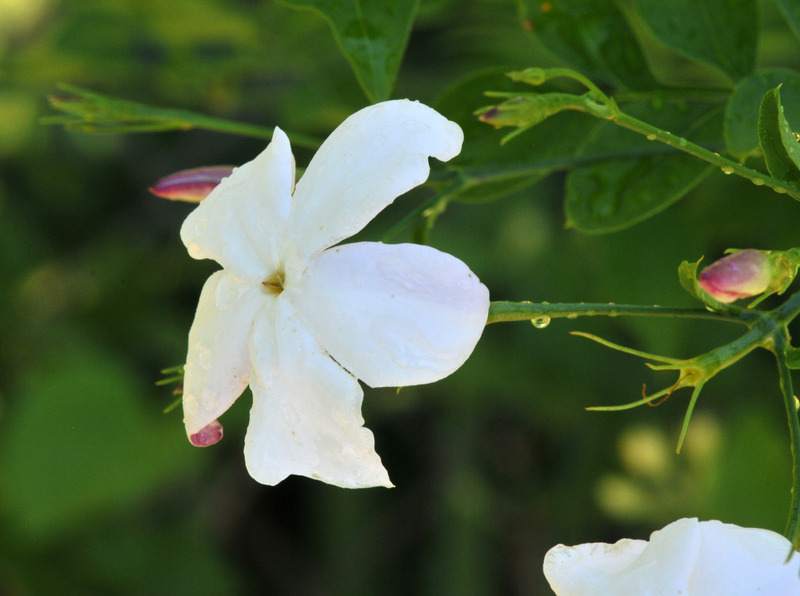 Azores jasmine has more delicate petals but a sweeter fragrant. This is the mysterious jasmine I’ve been looking for. Have you seen it? It’s that time of year again, when our Jasmine blooms profusely. They perfume the garden in the evening and early morning. I line them up on the pool deck where they can get full sun and are easy for me to collect the flowers. 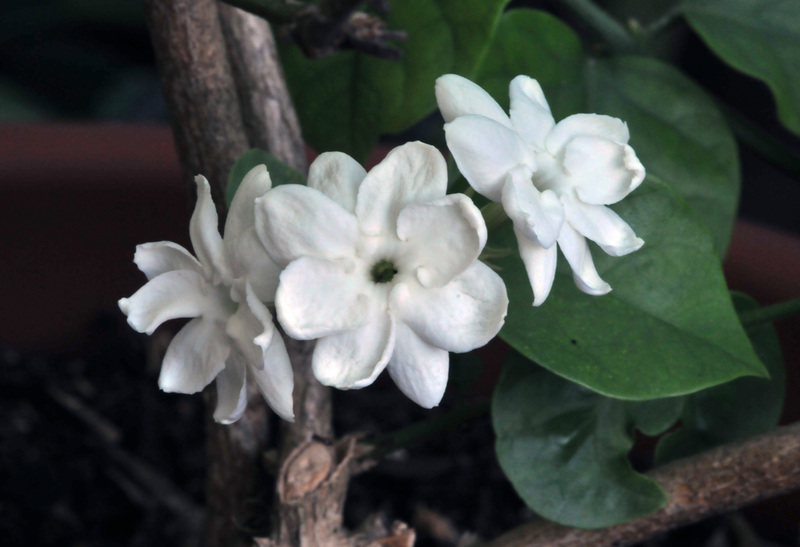 The Jasmine “Maid of Orleans” (Jasminum sambac) are the ones that bloom before any other jasmines I grow. They bloom throughout the year but only sporadically when we keep them inside. I don’t blame them since they only get to enjoy outside sunshine and heat for a few months out of the year. But they are nice enough to produce flowers even when they are cooped up in our basement under artificial sunlight. It’s a Zen moment when picking jasmine flowers. 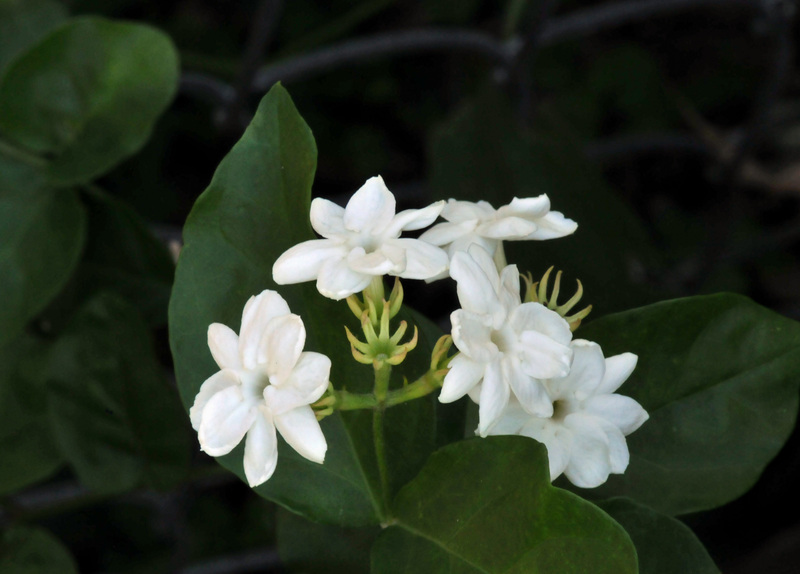 The fragrance calms your nerves; take a full breath of jasmine and let it out slowly while picking them. Enlightenment is within reach. On working days, I’m ready to face a crowded commute to the city again thanks in part to Jasmine and its wonderful effects on me. Anyway, jasmine is not just good for it’s fragrance. You can use the flowers as an air freshener, offered as a garland, used in cooking or infused in drinking water and tea. 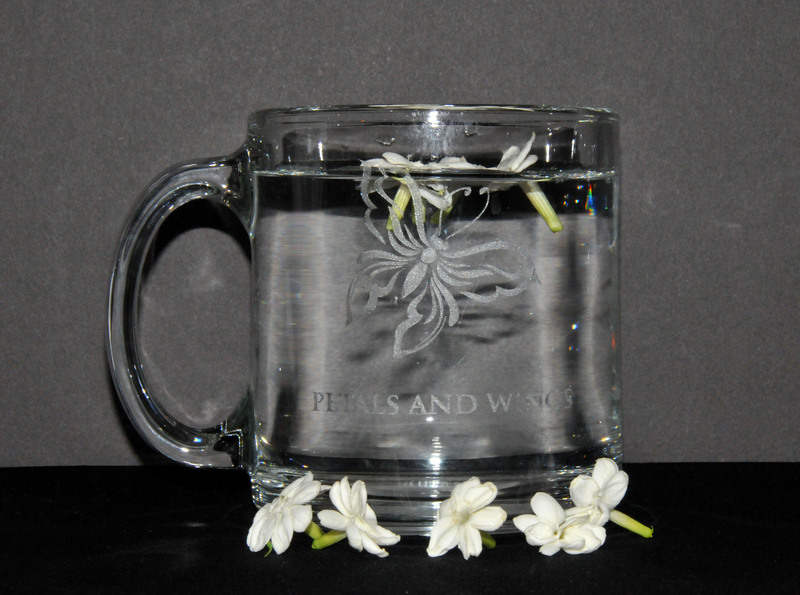 I float fresh jasmine flowers in water to give the water a wonderful scent that is very soothing and cooling in summer. I mix the dry ones in tea to make jasmine tea from the mix. 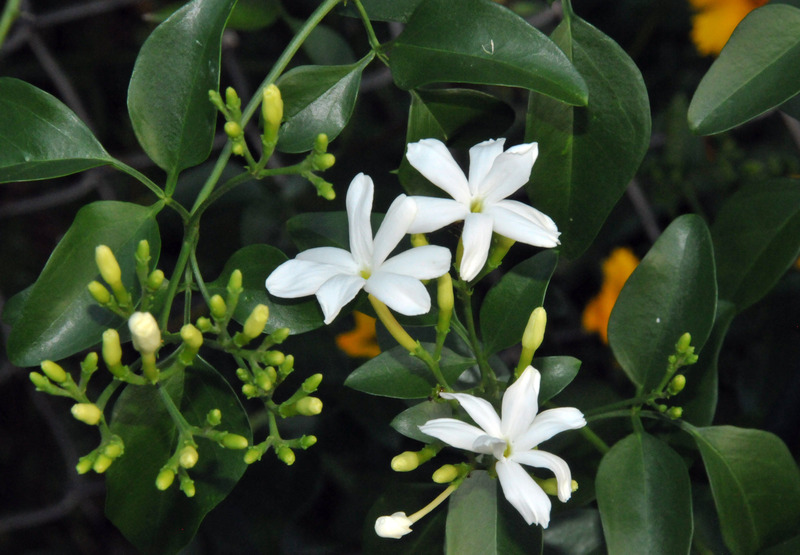 Just keep in mind that you should use only the Maid of Orleans (Jasminum sambac) which may be sold in other names, like Arabian Tea Jasmine, for instance. This is the only one I know of that can be used in food. You should also make sure that the flowers weren’t sprayed with pesticide. You don’t want that in your tea. 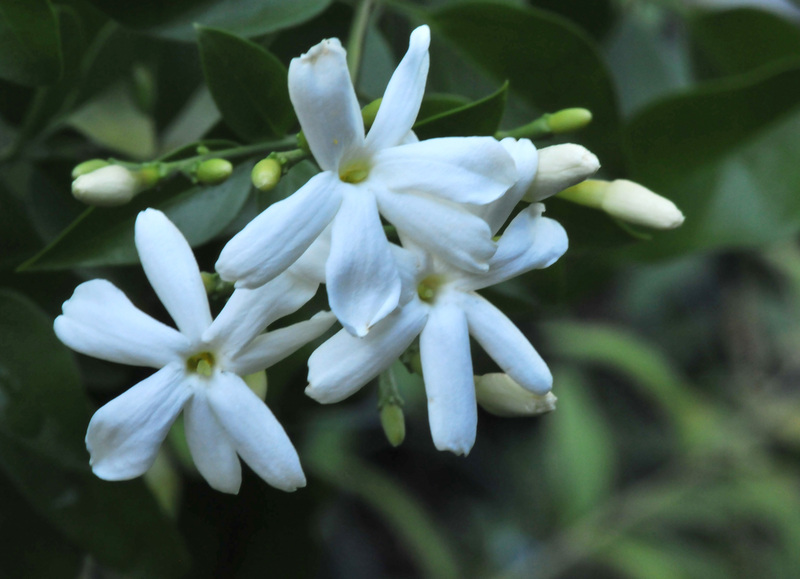 Growing jasmine is easy and you’re better off growing your own if you want to consume it too. 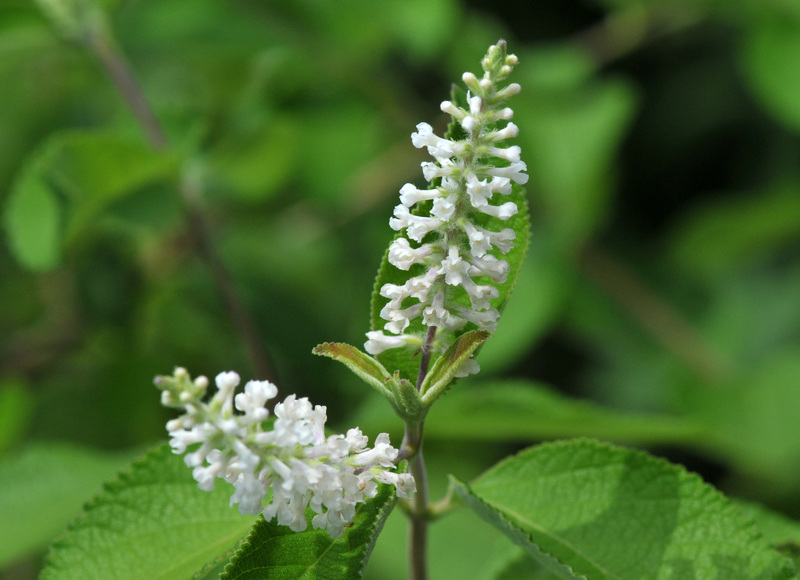 They flower profusely in summer.